It is a truism that all models are wrong. Just as no map can capture the real landscape and no portrait the true self, numerical models by necessity have to contain approximations to the complexity of the real world and so can never be perfect replications of reality. Similarly, any specific observations are only partial reflections of what is actually happening and have multiple sources of error. It is therefore to be expected that there will be discrepancies between models and observations. However, why these arise and what one should conclude from them are interesting and more subtle than most people realise. Indeed, such discrepancies are the classic way we learn something new – and it often isn’t what people first thought of. In climate science there have been multiple examples of each possibility and multiple ways in which each set of errors has arisen, and so we’ll take them in turn. These errors can be straight-up mistakes in transcription, instrument failure, or data corruption etc., but these are generally easy to spot and so I won’t dwell on this class of error. More subtly, most of the “observations” that we compare climate models to are actually syntheses of large amounts of raw observations. These data products are not just a function of the raw observations, but also of the assumptions and the “model” (usually statistical) that go into building the synthesis. These assumptions can relate to space or time interpolation, corrections for non-climate related factors, or inversions of the raw data to get the relevant climate variable. Examples of these kinds of errors being responsible for a climate model/observation discrepancy range from the omission of orbital decay effects in producing the UAH MSU data sets, or the problems of no-modern analogs in the CLIMAP reconstruction of ice age ocean temperatures. In other fields, these kinds of issues arise in unacknowledged laboratory effects or instrument calibration errors. Examples abound, most recently for instance, the supposed ‘observation’ of ‘faster-than-light’ neutrinos. There are of course many model errors. These range from the inability to resolve sub-grid features of the topography, approximations made for computational efficiency, the necessarily incomplete physical scope of the models and inevitable coding bugs. Sometimes model-observation discrepancies can be easily traced to such issues. However, more often, model output is a function of multiple aspects of a simulation, and so even if the model is undoubtedly biased (a good example is the persistent ‘double ITCZ’ bias in simulations of tropical rainfall) it can be hard to associate this with a specific conceptual or coding error. The most useful comparisons are then those that allow for the most direct assessment of the cause of any discrepancy.”Process-based” diagnostics – where comparisons are made for specific processes, rather than specific fields, are becoming very useful in this respect. When a comparison is being made in a specific experiment though, there are a few additional considerations. Any particular simulation (and hence diagnostic from it) arises as a result from a collection of multiple assumptions – in the model physics itself, the forcings of the simulation (such as the history of aerosols in a 20th Century experiment), and the initial conditions used in the simulation. Each potential source of the mismatch needs to be independently examined. Even with a near-perfect model and accurate observations, model-observation comparisons can show big discrepancies because the diagnostics being compared while similar in both cases, actually end up be subtly (and perhaps importantly) biased. This can be as simple as assuming an estimate of the global mean surface temperature anomaly is truly global when it in fact has large gaps in regions that are behaving anomalously. This can be dealt with by masking the model fields prior to averaging, but it isn’t always done. Other examples have involved assuming the MSU-TMT record can be compared to temperatures at a specific height in the model, instead of using the full weighting profile. Yet another might be comparing satellite retrievals of low clouds with the model averages, but forgetting that satellites can’t see low clouds if they are hiding behind upper level ones. In paleo-climate, simple transfer functions of proxies like isotopes can often be complicated by other influences on the proxy (e.g. Werner et al, 2000). It is therefore incumbent on the modellers to try and produce diagnostics that are commensurate with what the observations actually represent. Flaws in comparisons can be more conceptual as well – for instance comparing the ensemble mean of a set of model runs to the single realisation of the real world. Or comparing a single run with its own weather to a short term observation. These are not wrong so much as potentially misleading – since it is obvious why there is going to be a discrepancy, albeit one that doesn’t have much implications for our understanding. The implications of any specific discrepancy therefore aren’t immediately obvious (for those who like their philosophy a little more academic, this is basically a rephrasing of the Quine/Duhem position on scientific underdetermination). Since any actual model prediction depends on a collection of hypotheses together, as do the ‘observation’ and the comparison, there are multiple chances for errors to creep in. It takes work to figure out where though. … we compare the result of the computation to nature, with experiment or experience, compare it directly with observation, to see if it works. If it disagrees with experiment it is wrong. actually doesn’t work except in the purest of circumstances (and I’m not even sure I can think of a clean example). A recent obvious counter-example in physics was the fact that the ‘faster-than-light’ neutrino experiment has not falsified special relativity – despite Feynman’s dictum. But does this exposition help in any current issues related to climate science? I think it does – mainly because it forces one to think about the other ancillary hypotheses are. For three particular mismatches – sea ice loss rates being much too low in CMIP3, tropical MSU-TMT rising too fast in CMIP5, or the ensemble mean global mean temperatures diverging from HadCRUT4 – it is likely that there are multiple sources of these mismatches across all three categories described above. The sea ice loss rate seems to be very sensitive to model resolution and has improved in CMIP5 – implicating aspects of the model structure as the main source of the problem. MSU-TMT trends have a lot of structural uncertainty in the observations (note the differences in trends between the UAH and RSS products). And global mean temperature trends are quite sensitive to observational products, masking, forcings in the models, and initial condition sensitivity. Working out what is responsible for what is, as they say, an “active research question”. This all makes sense, but will the IPCC report, which influences investment and policy decisions, reflect your statement that the reasons for mismatch between modeling and observation is an active research question? Will it retain the high degree of confidence regarding catastrophic anthropogenic global warming without clear answers for the responsibility of the mismatch? Related to this, at conferences many modelers compare their results relative to “observations”, but do not mention what those observations are. That makes it hard for a listener that is knowledgeable with observations to judge whether the deviations are due to the model or the observations. Thus my plea to the modelers: please mention the name of the observational dataset in your legend. Other criticisms are also discussed, including one that the whole issue, underdetermination, is overblown. My point, however, is that you should not use this argument unless you are willing to accept Quine’s general picture of knowledge. I for one, am not. Quine is a powerful representative of an epistemological tradition of thought that currently dominates the English-speaking world, but it is a tradition that has basically reached a bad dead end. More detail than that would not be appropriate for a bog dedicated to climate science. Stripmining the future is its own reward, thus far. I think your example concerning neutrinos and relativity is off the mark. Implicit in Feynman’s dictum is that the observations have to be correct. That’s ‘correct’ in a scientific sense, not a philosophical one. In the latter sense anyone who’s stayed awake in their Phil 101 course knows there’s no such thing as ‘correct’ (though you keep arguing anyway); while in the former sense the new airplane design either crashes or it doesn’t. By the way, I thought it was admirable when the authors of the neutrino experiment more or less said at the time, “this is what we found but we could easily be wrong”, inviting others to help figure out why. Hi Gavin, good to see these things set out in a good, logical manner. I wonder if it works better to separate the “model” from the “simulation”? i.e. don’t lump errors in the forcings (boundary conditions) and initial conditions in with the model errors. I prefer to think of it this way: you have a model and you want to test whether it behaves like the real world. So you try to simulate some aspect of the real world and compare the simulation with observations. This is evaluating the simulation, not the model per se. If there is a discrepancy between simulation and observations, it might be (partly) because of errors in the forcings or initial conditions or in some other aspect of the experimental design. You say all this, of course, in your item 2 (model error) — but the point is that it isn’t model error. A high degree of confidence is appropriate, given that catastrophic anthropogenic global warming is already occurring right before our eyes, all over the world. Deniers have to work very hard to ignore it. And yet, what we have is quite clearly a case of holistic underdetermination. Even if we do find a discrepancy, it may not be possible to state exactly which of the hypotheses underlying our model, and we cannot even state that there is a statistically significant discrepancy. The Popperian paradigm only works for logically simple theories, and it works best when you have multiple theories with which to compare an observation. After all, even after the negative findings of Michelson and Morley, physicists did not reject the aether. The Lorentz equations were initially derived assuming that motion causes compression of the aether. You mean dead because “there may be little at stake since the “fantasy of irresolubly rival systems of the world” doesn’t get anywhere useful? Those claiming AGW can’t be true because:FREEDOM don’t think their position is a fantasy. They do seem to think their position is irresolvably at odds with the science and economics that show we’ve been stripmining the future to make money faster today. In observational error, you’ve omitted the biggest one: the sample isn’t a representation of the population. There are statistical tools to measure that but they also rely on assumptions about the population. There are many measures used in climate science but limitations on accessibility or funding can often create a variety of sampling techniques not all of which have the same certainty wrt the population they represent. Random sampling errors are actually fairly well understood, even for “distribution-free” cases, and if you have enough data, this isn’t really a problem. Climate science is quite fortunate in this regard, as data are not scarce. The trick comes in interpreting the data, and that requires models. In general, the longer a result has stood, the more you are likely to be able to take it to the bank, precisely because more data will have accumulated and any errors in interpretation will likely have been found. The idea that a single observational disagreement will make the problem go away is sheer fantasy, and ignorant fantasy at that. I have been reading this blog for nearly ten years and think that Gavin taking us on a trip down a summary of academic theories relating to gaps in prediction and observation very disappointing, partly due to the assumption that he is an expert in those areas now. When was the last time we had some straight shooting regarding the implied power of the prediction made by models, the championing of them here and the advocacy power they have. Very disappointing to see the emphasis of conviction shift to paleo- climate alone when the tide turns. Gavin, regarding your response in #1: If you think that policies are being made based on exact numbers coming from a climate model, I’d have to ask for some evidence. For the next two decades, a warming of about 0.2 C per decade is projected for a range of SRES emission scenarios. Even if the concentration of all greenhouse gases and aerosols had been kept constant at year 2000 levels, a further warming of about 0.1 C per decade would be expected. The table immediately below said paragraph predicts sea level rise with two significant digits under a variety of scenarios. You must be aware that this report has been cited numerous times by Nancy Pelosi, Harry Reid, Al Gore, and many lobbyist organizations pushing cap and trade legislation and many other EPA regulations. While I agree that any mismatch between models and observation “…in all respects is normal and expected.”, it is the very quantity in bold-face in the FAR summary that is both mismatched and driving these policy considerations. What I was hoping for in this post was some technical leads for the mismatch, specific to your bullet point #2, above. Is it the fundamental CO2 forcing prediction, based on effective radiation temperature to space? Or the indirect CO2 forcing predicted due to H2O increases at high altitudes that have not materialized? I am probably as aware of any reader here of modeling challenges in general, and can appreciate the work your groups have performed, but I can also appreciate the implications of the mismatch that prompted your post: there is fundamental uncertainty in the interaction of the complex mechanisms that drive climate change, including the human effect. Maybe it’s a chicken/egg problem, but how do you test basic assumption like gridding? I would think model disagreement with sample could be attributed to a number of things unrelated to the model: 1) the natural event is extreme so the actual population including its sample is outside model limits, 2) the sample is not an accurate representation of the population or 3) the population is more complex or dynamic than the sample methods. As an example (and I don’t have data, just a thought experiment), when we estimate average global temperature and we grid up the planet, how do we test that the grid size is appropriate to sample? How do assess whether grid size required for accurate population is potentially seasonally or geographically (or both) dependent? Or if the grid is oversampled in certain areas? If the model is the only test, it could be revealing an extreme population, and extreme sample or model error. How do we know a model could be exactly accurate but the data it needs 10×10 sq mile sample sets in the ENSO SST region but only an 100×100 sq mi sample sets in Ukraine? Maybe it’s my ignorance of available data but I don’t know how to measure sensitivity to that kind of sampling error. It seems the goal is to get the model to agree with the sample but how do test the sample against the population and how do you estimate the variance in the population with the variance in the sample? 2012 is different from 2013. Both are represented as a population (nature) and as a sample of population (our measurement of nature). Is one of the populations extreme? Is the sample correlated well enough to the population? Are sampling methods dependent on conditions? Do we treat sampling as part of the model or separate? Please, a glossary for the various abbreviations in your post. Gavin, would it be safe to assume that you have enough confidence in paleo inferences to have mismatch of models to observation lessen your conviction we remain on a worrying path. In other words does it lessen your certainty or just point to gaps in knowledge that will eventually still bear out the overall thrust that anthropogenic contribution is worrying. I think it is pertinent to the discussion. Also in 12 you say ” and models are consistent with inferences from paleo” could you elaborate, on face value it seems incorrect, I must be missing something. Gavin, I’ll have to read up on Quine to grasp your deeper epistemological point here, but your examples seem far off. The faster-than-light neutrino experiment was an *error*, so of course it didn’t falsify special relativity. I’m sure Feynman didn’t claim that errors falsify theories, so there’s no contradiction of Feynman’s dictum here. Saying that a map doesn’t capture the true landscape or a portrait the true self is very confusing as a lead-in to a discussion of climate models. Maps actually do capture what they are supposed to capture, quite accurately. I don’t know what you mean by a portrait, but it’s not going to be a good analogy for a science like climate science. I think it would be bad, bad news for climate scientists to start talking this way, to start retreating behind vague figurative/artistic analogies to describe their ability to cohere with reality. Adopting an epistemolgy of lower standards, one where hypotheses or theories can’t be falsified, creates too much room for bias and motivated reasoning. Perhaps it wasn’t your intention to suggest a sloppy, low standards epistemology. Climate science is viewed by outsiders — and described by Judith Curry — as a biased, groupthink-driven field. There is very little that scientists can learn from 20th century epistemologies — many of which would make science impossible. The last thing climate science needs right now is some wishy-washy epistemology. actually doesn’t work except in the purest of circumstances (and I’m not even sure I can think of a clean example). The dimensions are traceable to international standards. I can measure both distance, velocity and time in SI units. If the traveled distance does not fit with calculated distance within the uncertainty calculated by using the international standard Guide to the expression of Uncertainty in Measurement the model might be wrong. The model is useful if I can make predictions which affect my choice of action. In my every day life it is useful even within uncertainties of 10 – 20 % (caused by uncertainty in predicted velocity) when estimating time of arrival. If the uncertainty became to high it would not be useful. For the model to be useful it must be correct within some level of standard uncertainty for some averaging period. And repeatably so for many periods. This is almost worth a post in itself, as these fundamental misunderstandings are the basis for so many skeptical arguments (in particular combining the single realization of the real world with an ensemble mean). So, if the model doesn’t work, there’s nothing to worry about? Since I’m spreading admiration around, I reckon you should get some, too: you had to know a discussion of this type would be lively! So let’s go to your responses to #18. Just because v = D/t doesn’t mean that all predictions based on Newton’s law of motion are tautologies. I agree that for some ‘simple’ theories they are so obvious in retrospect that they seem so. For example, if I measure v using D/t as my rocket leaves the atmosphere, it is not a tautology to predict where it will be 5 or 6 years from now so that it can drop a probe on Jupiter. Ah! But maybe it didn’t make it to Jupiter. Does this falsify the theory? No, I forgot to account for the orbital motion of Earth and Jupiter, so indeed this expensive miss does not invalidate Newton’s theory. If I understand you correctly this is what you are getting at. Nevertheless, it is surely possible to take into account the appropriate factors, calling into use gravitational constants and what-not, and come up with a better prediction. If I include only Earth and Jupiter the result will still be off, but I reckon that if I start taking the Sun into account my prediction will start looking a lot better. Maybe it needs tweaking a bit due to the lunar fly-by before it starts looking really good. Nevertheless, while each of the ‘pieces’ of this construction comprises equally simply things like D=vt and F=GMm/r^2 the final prediction is not a tautology. I would venture to say that this is how science is supposed to work, and it is perverse to insist that Feynman’s philosophy be judged on the basis of the first simplistic ‘experiment’. It is the job of a scientist to know which theory/hypothesis is being tested by a given experiment, and is at the root of what I would call a properly designed experiment. Maybe we can say that a good scientist is able to take the world of Quine and reduce it to the world of Popper, at least to an extent that is ‘good enough’. Just to belabour the point; notice that my Jupiter prediction failed to take into account either the colour of the rocket’s paint or the newly discovered earthlike planet around Alpha Centauri (or wherever) because my scientific judgement tells me that while this leaves me open to the criticism that my model is incomplete, I have good reason to believe that these things don’t matter in the current context. Indeed, if pressed I can estimate the impact using the same D=vt and F= etc. and show this to be the case. Maybe I launch several probes that all arrive safely, and in my mind I elevate my model to a ‘theory of Earth-Jupiter space travel’. Now, suppose that next year I launch another probe, and this time it misses. Does that falsify Newton’s laws? Perhaps, but it’s more likely that my theory was incorrect. I check things out a bit and notice that this year Mars has moved close to the flight path, so previously I got the right answer with an incorrect theory that posited no influence from the planet Mars. Scientific honesty requires me to admit to another expensive error and revise my theory to include the new factor, and once again attempt the conversion of a Quine to a Popper situation. My, my, I have gone on and I should probably get to the point. There is philosophy and there is science. If scientists behaved like philosophers nobody would ever get anything done because they’d all be too worried about having missed some factor, and anyway what if I’m just imagining the space probe in the first place? In a scientific sense it MATTERS very much what measurements say, and I will say again that measurements are the only things that really do matter. It’s not sufficient to say that they might be wrong, or they might be measuring something different from what they seem to, and so therefore I might be right even though my theory doesn’t agree with them. The job of a scientist is to sort through the mess and develop a theory that can account for the measurements. Furthermore, for that theory to be useful it must be capable of producing verifiable predictions (e.g. the probe will get to Jupiter no matter what year I launch it). If the predictions don’t work out then the theory must be modified or abandoned. Anything less is not science. This is a personal perspective of the subject from that of a practicing statiscian, and only a very amateur climate guy. “There is basically one observational record in climate research.” (See Slide 5, http://www.atmosp.physics.utoronto.ca/C-SPARC/ss08/lectures/Kharin-lecture1.pdf) And this is an issue. For there is enough variability in Earth’s climate that if the system were “initialized” again, say, 50 years back and somehow magically all the external inputs to the system kept exactly the same, the result would be a little different. There is a debate about how big this “internal variability” is (see Kumar, Chen, Hoerling, Eischeid, “Do Extreme Climate Events Require Extreme Forcings?”, http://dx.doi.org/10.1002/grl.50657), with climate amateur but statistician me coming down on the side of “not as much as you might think”. (My reasons are complicated, and I’ll write them up in an upcoming paper I’m putting on arXiv.org, that being a critical review of the statistics in the recent NATURE CLIMATE CHANGE paper by Fyfe, Gillett, and Zwiers, shared first with those authors. There are different flavors of variability beyond internal and external. See http://hypergeometric.wordpress.com/2013/08/28/overestimated-global-warming-over-the-past-20-years-fyfe-gillett-zwiers-2013/ for more.) But the point is, such variability makes modeling even harder, for not only are the general parameters of the physical system necessary to get right, but, if prediction is a goal, actually TRACKING the actual realization Earth is taking is part of the job. Slava Kharin argues, and I agree, that the one-observational-record reality means a Bayesian approach is the only sensible one. That’s not universally held in geophysical work, however. Nevertheless, it’s important, I think, to parse properly what this all means. The reason why we want models is to help understand what data means, and what physical effects are important, how much, and how. We, of course, also want to use them for policy predictions, but using these as predictive devices is a tricky business. Statistically speaking, NONE of that should be taken to mean the long term projections are off in expected values in any significant way. Forcings are forcings, and AB INITIO physics says that extra energy needs to go someplace and be dissipated throughout the (primarily) fluid systems of Earth somehow. The devil is in the latter details, as are the impacts. But they will occur, even if amounts and timings will be off, as they necessarily must be. So-called “two-sample comparisons” are tricky in complicated systems. Most direct techniques for doing so assume constant variation over large swaths of samples. That kind of approach tends to give large Regions of Probable Equivalence (ROPEs) which, of course, are less useful that otherwise. When this is done for predicting elections, say, something called “stratification” is used, where observations are qualified by (in this case) spatial extent, time of day, and other auxiliary variables and the response state of atmosphere considered as conditioned on these, and the model evaluated comparably, where it can be. Alas, sometimes doing that leaves few observations or few model runs to compare. That’s okay if a Bayesian approach is used. Not so much otherwise. Gavin said all this, but I wanted to second his view, giving mine, as well as put a note about my ongoing hard look at Fyfe, Gillett, and Zwiers. I have to echo some of the comments made above concerning the reliance on paleo studies. The notion that proxy ESTIMATES of temperature 1000 years ago when there was no anthropogenic CO2 are a superior test of AGW theory than current temperature MEASUREMENTS in the presence of a significant anthropogenic CO2 component strikes me as absurd. Models tap into the physical world processes but focus only on a given range of frequencies. Therefore any interpretation – conclusion is prone to human error. To understand future states better it appears to involve as much data as possible (which would also increase error rate). It would help to identify tipping point systems of the spectrum better. The conclusiveness, the reliability should increase with data spectrum ratio. I really like to read another post on CMIP5, combined modelling with all methane forcings. But even a small data model (for instance analogous albedo “Daisyworld”) seems to be reliable in predicting trends. do not try to disentangle signal from noise, but supply impact assessments with climate scenarios containing both elements and also companion descriptions of future climate that contain only noise, thus allowing impact assessors to generate their own impact signal-to-noise ratios (Hulme et al., 1999a). When it comes to science messaging i think it would help to point out more often general agreements/predictions and underestimation (and why).
? —?Blackadder II, British Comedy set in Elizabethan times. To paraphrase Tip O’Neill, all catastrophe is local. And when “local” catastrophes are occurring everywhere at once, that’s “global”. The millions of people all over the world who have already experienced mass destruction of their homes, livelihoods, food supply and/or water supply as a result of AGW-driven climate change and extreme weather might not agree that the changes we have seen so far are “not catastrophic”. Which is, of course, why the primary “mission” of the deniers at this point is to deny any link between global warming and these ongoing and rapidly escalating effects — to argue, in essence, that yes, the world is warming; and yes, we are experiencing exactly the sort of effects that climate science has predicted for a generation would result from that warming; but no, those effects are not the result of the warming. So what is causing them? According to the deniers, nothing. They are just our imagination. And right on queue, for a perfect example, see the piece in today’s Washington Post by Bjorn Lomborg, perhaps the hardest working denier in show business. Sure, your decades of smoking cigarettes have given you lung cancer. And yes, you are coughing up blood. But you can’t attribute every bloody cough to the cancer. There are always bloody coughs every once in a while. It’s just natural variation, you see. And it doesn’t mean you are going to experience “globally catastrophic” effects from the cancer, like, you know, death. Gads! As a daily user of ESRI software for more than 20 years, I shudder at the thought of their executives being taken as authorities on anything but sales. I suppose he thought he was being clever, but the notion of reality as a database is absurd. After decades of producing books along the lines of “Modeling Our World: The ESRI Way,” I guess they believe their own propaganda. I wonder if there is a non-equilibrium quasi steady state non-reproducible thermodynamic system, one with a vast number of internal degrees of freedom (other than the terrestrial climate system), which is successfully described by a computational model. If its dimensions are small enough to make it fit into the lab and studied that way in controlled experimental runs, so the model is verified properly, it is even better. – A system is reproducible if for any pair of macrostates (A;B) A either always evolves to B or never. Naomi Oreskes, Kristin Shrader-Frechette, Kenneth Belitz, “Verification, Validation, and Confirmation of Numerical Models in the Earth Sciences,” SCIENCE Vol. 263, No. 5147 (Feb. 4, 1994), pp. 641-646. Note that your argument applies analogously to natural language too. To help “climate change communication” in the public debate, I have been trying to create a natural-language-style flow-chart cartoon language that illustrates the principles of the lack of precise prediction in complex systems, for purposes of elementary pedagogy. This is not climatology, it is (non-mathematical) general systems to picture different things in the same format.. They are all exactly one-minute long. The “food web” cartoon (#3) takes a similar approach. With regard to comparisons (evaluation may be a proper word here) of models to (using) satellites, it is worth pointing out that this is a big research field in its own. There are various approaches for comparing these two and each approach has its own advantage and limitation. For example, 1) one can do a “traditional” comparison whereby one compares means, standard deviations etc with satellite based estimates. This will tell you if a model captures the overall range of values and spatial variability, but will not tell you anything about how good any particular process is simulated. 2) Another way would be to carry out a process-oriented comparison, wherein one focuses on a set of processes or natural variabilities (e.g. ENSO, NAO or Indian Ocean Dipole) and investigate how good a particular model reproduces climatology of certain variables during those processes/variabilities (in reference to similar climatology from the satellites). But this approach will not have the advantage of the first one. 3) One could also employ satellite simulators so as to avoid comparing apples to oranges. The simulators take model data of a certain geophysical variable and carefully simulate it in a way particular satellite sensor would have seen that variable. This ensures a fair comparison. And it not only takes care of mismatches and sampling issues between models and satellites, but also different sensitivities of different satellite sensors to geophysical variables. 4) Eventually one could combine any or all of the approaches above, which I think would be the most stringent litmus test of the models. All of this, of course, only applies if you have satellite based data sets (which in most cases go back to 1979) for comparison. The same can be said of models. A model need not even be the best to accomplish this–Tamino’s 2-box model is a case in point, as its simplicity allows the important contributors to climate to be isolated and assessed. On the other hand, the denialist model… Oh, yeah. There is no denialist model. And you guys wonder why no one intelligent takes you seriously? In case the system can be studied experimentally in a controlled lab environment, definition of “successfully” is straightforward. Both the experiment and model simulation can be run as many times as necessary with controlled parameters. As the system is supposed to be non-reproducible, only statistics of macroscopic state variables are comparable, of course, but with enough runs that can be made to converge to an arbitrary degree, provided the model is “correct”. If it is not, divergence is clearly visible, that is, the model is falsified. In case of modelling a single run of a unique physical instance, I have no idea what “successfully” means. [Response: Similar to your first point – coherent statistics over time periods, robust patterns of teleconnections, process by process similarities, coherent emergent properties, quantitative matches in response to large perturbations (volcanoes, orbital forcing, continental configurations etc.). However, theories in physics are usually supposed to hold for a wide class of systems, some of which may be studied in the lab. In that case it is a must to do so, because it is the easiest way to verify a theory. This is what one would expect in this particular branch of nonequilibrium thermodynamics, but I must admit I am ignorant enough to be unaware of any such attempt. Can you give a pointer? Or explain why it is not done, should that be the case. BTW, for reproducible systems we know quite a lot. Unfortunately the terrestrial climate system does not belong to this class. There are model errors and there are model errors. However, we’re not talking about one or a few mismatches between model predictions and observational data. Instead we are talking about the wholesale failure of the models to “predict” global temperatures, despite the undeniable increase in CO2, upon which the IPCC bases its reports and forecasts. All of the models ca 2007 that the IPCC used to forecast climate change predicted a steady increase in temperature (based, as they were, on the assumption that CO2 is the primary driver of temperature) and yet global temperatures have remained essentially flat since then. In short, the models have been “falsified.” Unfortunately, science — Big Science — is not Popperian but Kuhnian, and all that matters is the defense of the prevailing Paradigm, and the data be damned. Thanks Gavin for the discussion. Your reference to the Paleo is understood, however as with models there must be some inherent uncertainty in the different methodologies (particularly the transient constraints as recent data should also be accounted for in them). My point about all this really is how are any of these actually tested beyond theory, I fully appreciate the shortish time frame where we see a mismatch being a problem asserting anything is wrong yet, but could it do just that if it persistently continues? i.e. are the paleo inferences ever testable over decadal timeframes? Or any timeframes? Ray, who decides what the “insight” from model mismatch should be? What evidence is there for the assumption that climate sensitivity based on paleo record is applicable to present day? I would expect it to vary quite significantly based on factors such as ice cover, ocean currents, biosphere etc. Who decides on the insight? The relevant community of experts, of course. Who is in a better position to appreciate the strengths and weaknesses of a model and where it is most likely to bear fruit if tweaked. And ultimately, if the mismatch is sufficiently severe, the same experts will develop a different model. That is how science works. I’ve seen too many people taking the map for the terrain. Many of them armed with computer models, often produced with ESRI software. And while were on irony, I once had a client ask me why we couldn’t have a spatial database at a scale of 1:1? After all, it was a computer model… Borges would have laugned. There may be reason to strongly suspect that in any sufficiently complicated dynamical system model (such as climate) with stochastic parameters (e.g., exactly when and where a lightning strike starts a major wildfire or a major submarine earthquake perturbs ocean circulation in a region or a major volcanic eruption introduces stratospheric aerosols), it is almost certain that any given run of the model will have periods of significant deviation from the mean of multiple runs. 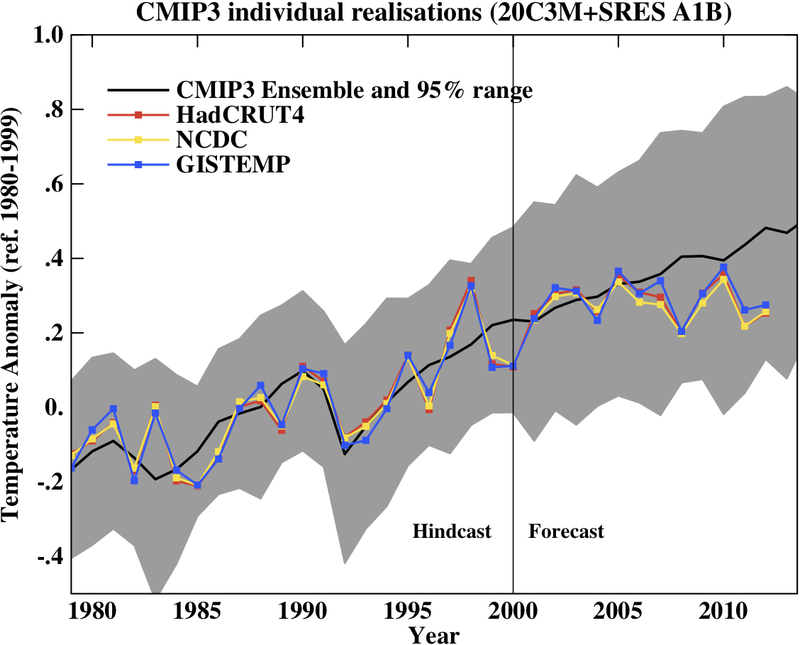 In other words, we should expect the “real” climate to significantly differ from ensemble means. The paper V. I. Klyatskin, “Clustering of a positive random field as a law of Nature” Theoret. Math. Phys. 176(3):1252-1266 (Sep 2013) treats much simpler models, but it rigorously establishes the conditions under which such behavior occurs in the simpler models. Abstract: In parametrically excited stochastic dynamical systems, spatial structures can form with probability one (clustering) in almost every realization because of rare events occurring with a probability that tends to zero. Such problems occur in hydrodynamics, magnetohydrodynamics, plasma physics, astrophysics, and radiophysics. Gavin, is the issue of model mismatch related at all to confidence levels. I’m thinking of things like the last IPCC report saying that they were 90% confident that the warming of the 20th century was mostly caused by human activity. I assume a similar confidence level about future anthropogenic warming. Is there a post on how such confidence levels are calculated? I’m familiar statistical methods that social scientists use, like regression, ANOVA, MLM/HLM, SEM, and the PCA stuff that came up with Mann. We never generate confidence levels around a prediction that spans a large body of work, except maybe some Bayesian stuff. We have many studies presenting the projections from GCMs under various forcing scenarios where unforced variability is simulated, and we have a few studies (not many I think) which have a model reproduce the *actual* forcings and unforced variability and see how well the output matches observations (a recent one by Yu Kosaka and Shang-Ping Xie being a case in point). I don’t know of any studies where the GCM runs are re-done with real-world forcings and unforced variability to pin down exactly where the original projections differed from reality. Presumably this is done by modellers to improve their models but are the conclusions published? They might say for example, “Ah yes, run number 12 in GCM model XYZ was a little too warm but that’s because real world forcings were a little lower than in the projections – the physics was correct, it was the scenario that wasn’t quite right”. In other words we want to know whether projections were off because the inputs haven’t matched reality or because the physics isn’t quite right. Hope that makes sense! A map as a model of physical space has a characteristic perhaps worth mentioning here. The human map-user, on getting themselves lost within the physical space, will consult the map and often conclude that they are not lost but that the map is deficient in some way and thus continue ahead oblivious to their actual location. This can become remarkably absurd before the logic of the situation becomes apparent. I hear sensible people say that they managed to walk miles in the wrong direction, reassured by minor features that they were on-route and ignoring the obvious discrepancies all around them. Indeed, I remember myself once deciding that I was no-route even though the stream I was following was flowing in the wrong direction! Could there be a lesson in this for climatalogical understanding? If so, does it apply to you, to “us”? Or does it apply to the other lot? I know which I’d put my money on.